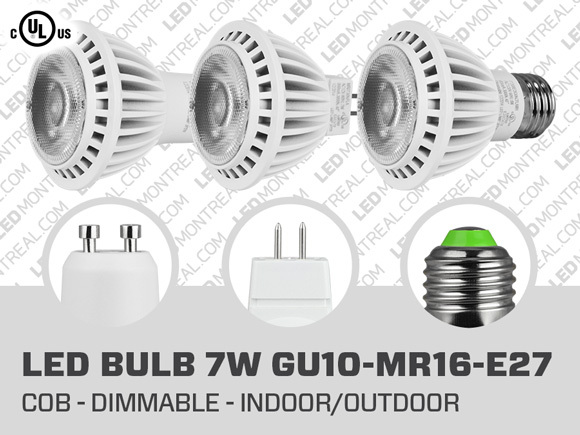 LED Montreal offers a wide variety of affordable eco energetic LED Light Bulbs. Buy your LED bulbs directly from Canada and save on your electricity bill. You can find all our LED bulbs in the LED bulbs Category. LED stands for light emitting diodes; the diode is a special semiconductor that emits light when electricity passes through it. LED lights are therefore lighting devices that use the light emitting diodes to give off light. Unlike the other lighting systems, electricity is used directly in LED lighting. Other lighting systems such as fluorescent or incandescent lighting use the electricity indirectly. The electricity will first create a charge that will light up a gas or a filament. This is why fluorescent and incandescent bulbs take some time to fully light up. LED bulbs were already being used as early as the 1960’s and 70's, however, it is not until a decade ago that the technology became popular.